Camaguey (Cuba) -- Buildings, structures, etc. This photograph is of a typical middle-class home in Camaguey. 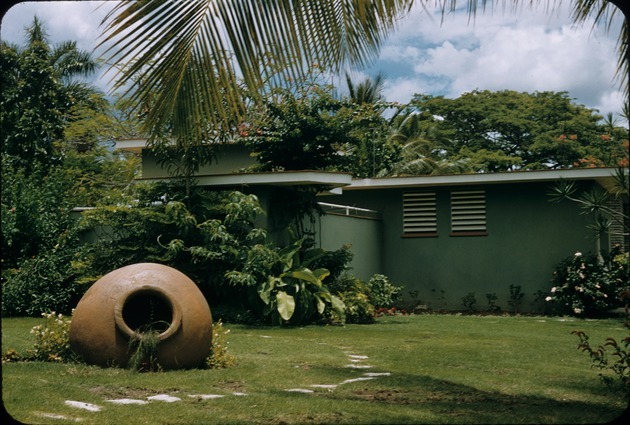 The large earthen jars in front of the home is very popular in the region and is called a tinajóne. The tinajóns were first used to store grains, wines, and oils brought to Cuba by Spanish immigrants that settled in the area in the 1700s. The permanent lack of water of the first settlements changed the function of the tinajones from the traditional use to serving as water storage containers. It is popularly believed that during the 19th century, every single house in Camaguey used to have at least one tinajon. The water being stored was used for drinking and to cooking.